After meeting at a "mommy and me" play group in 1986 Jeanne and I quickly became close friends. Little did we know it would lead to starting "J and J Finishing Touches" together a few years later. The desire to create a business occured to us both around the same time. We began designing children’s sweat suits and selling them at home parties. It was fun to get out at night and it put a little money in our pockets but we both knew we eventually wanted something involving home fashion. I had sewn formal wear through high school and college to make extra money, so that was an option, but the time involved with all the fittings and alterations was a part of the job I never enjoyed (I used to wonder why they all decided to loose or gain weight AFTER the first fitting!). I also taught a tailoring class at an adult end program for a semester. Jeanne learned to sew as a young girl like I did. She was also an accomplished knitter. Her blankets were beautiful but when I discovered she knitted a rocking horse into her son's sweater I was totally impressed! Obviously her daily commute on the rail road before she became a mother was put to good use! Creativity really knows no boundaries. It was during a conversation about similar home improvement projects we were both working on that we discovered we were each making our own window treatments. We completed our projects and realized a new business idea was taking shape. We then learned everything we could about window treatment design and fabrication and pumped anyone we knew in the business for information! We established business relationships with suppliers and set up professional workrooms in our homes. Home based workrooms allowed us to create and sew around our family's busy schedules. Our supportive families and friends were our first customers and word quickly spread. J & J Finishing Touches was off to a steady start! A few years later we each chose to go back to college. I studied interior design and Jeanne studied psychology. The two areas of study are a perfect compliment to each other in this business! Our kids are grown now and we have expanded the business but we chose to remain "home based". This decision enables us to pass the savings on to our many happy clients and provide our clients with the personalized, unique approach to interior design we are known for. 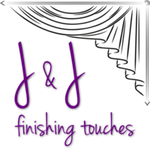 Contact us for a free in-home consultation and let us put the "Finishing Touches" on your home!